The paddock of the Hockenheim circuit was a sea of Ferrari during the last weekend of September, when thousands of owners and enthusiasts gathered for the Ferrari Racing Days meeting. The event featured rounds of both the 360 Challenge Shell Ferrari Maserati Historic Challenge series together with F! demonstration runs and free laps for members of Ferrari Club Deutschland, and international Ferrari club members. There were also two bonuses for participants, one was the presentation of the 550 Barchetta Pininfarina at the gala dinner at the circuit on Saturday evening, and the second was the presence of national hero Michael Schumacher for a time on Sunday afternoon. 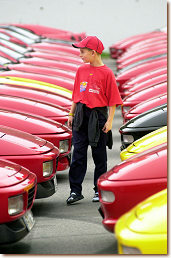 The Ferrari parking area in the paddock filled rapidly each day, and it was quite staggering to see so many 360 Modenas together, as up to now they have appeared only in relatively small numbers, but then this was Germany, the largest Ferrari market in Europe. It was also interesting to note that quite a large proportion of the German 360 owners had managed to get 360 as the numbers on their license plates. One of the most �unusual� cars in the parking area, that attracted a lot of attention, was a 456 GT finished completely in a matt olive drab paint scheme that even extended to the wheels, perhaps next time it appears it will be in full camouflage! Older models were in relatively short supply in the general parking areas, but one of note was the 250 GT SWB, chassis number 2269GT, of Reinhard Sammueller, whilst the unique 330 GT Fantuzzi spider, chassis number 8733, made a brief appearance on the Sunday morning. In the 360 Challenge series there were races for West and Central region competitors, with Johnny Cecotto, the Venezualan motorcycle star and successful touring car racer, participating in the Central region guest car to take a hard fought victory from Austrian Carl Baron in the final race of the weekend. The Shell Ferrari Maserati Historic Challenge series had two races for each of the three groups over the weekend, and featured some exciting racing that passed off without any major mishaps. The greatest problems stemmed from mechanical maladies, which sidelined a number of front runners during the course of the event. The Group A races for single seaters were devoid of any Ferrari presence after Corrado Cupellini�s Dino suffered transmission problems after setting the fastest practise time. This left the Maserati 250 F of Peter Heuberger to clean up with wins in both races, although he was chased hard both times by newcomer to the series, Roger Lucas in his Maserati 6 CM. With John May, Maserati A6 GCM, taking third place on Saturday, and Wolfgang Wegner Bscher, Maserati 4 CL, taking the final place on the podium on Sunday it was a clean sweep for Maserati. The Group B race practise times, for drum brake sports and GT cars,were headed by Burkhard von Schenk in his Maserati 300 S, with the Ferrari 250 GT TdF of Plinio Haas in second being the meat in a Maserati sandwich, as the A6 GCS driven by Robertino Wild took third fastest time. At the start of Saturday�s race first gear broke on von Schenk�s car as he accelerated off the line, causing rapid retardation until he selected second and staggered away. This caused massive avoidance action behind him, as the Wild A6 GCS, and those following on the left side of the track, had to clear the near stationary car as best they could. Fortunately everybody managed to do so without making contact. The pandemonium allowed Plinio Haas to profit and lead the race, chased by Carlos Monteverde in his 250 Testa Rossa. The yellow Testa Rossa ate into the lead of the 250 GT TdF and by the third lap it was in a lead that it held to the end. Unfortunately there was a paddock incident after the race which soured the victory, and resulted in Carlos Monteverde withdrawing his cars from the meeting at the end of the day, after a meeting with the race stewards. After finishing the first lap in eighth place von Schenk fought back to third to provide some consolation for the Maserati contingent. With no Testa Rossa and no von Schenk 300 S, because of the gearbox problem, the race on Suday was wide open for the rest of the field. From the green light it was Christian Traber in his Ferrari 250 MM who took the lead, which he held until a part broke in a carburettor causing the throttle to jam open, resulting in a spin that allowed Jeremy Agace in his Maserati 250 SI into the lead, which he held to the end ahead of the A6 GCS of Robertino Wild. The Ferrari 625 TR of Nicolas Zapata held a strong third place until the last lap when he lost two gears, allowing the Ferrari 250 GT TdF of carlo Vogele to take the final place on the podium. As the cars were being marshalled through the crowded paddock area to the parc ferme after the first Group B race, Carlos Monteverde was motioned on by a flag marshal, and as he moved forward somebody from one of the 360 Challenge teams pushed a tyre trolley into his path. Although he turned to avoid it, the front wing just caught it pushing it back, apparently catching the arm of one of the hostesses who was walking by. He was unaware of this and continued, leaving the car in the pac ferme then going to the marshalling area for the next race in which he was competing in his 365 GTB/4C. 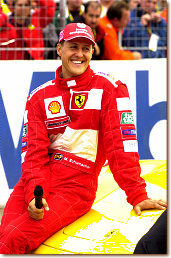 Upon returning to the parc ferme after this race he was reportedly set upon by stewards and taken to race control, where the sequence of events were relayed to him, and blame for the �injuries� (allegedly a broken arm) to the stewardess laid on him. Despite protestations and a request for the flag marshal to be summoned, which were ignored, he was told that his cars would be impounded until a 4000DM fine was paid. Apparently this was to be given to the stewardess as she wouldn�t be able to work for some weeks. He was somewhat piqued at the attitude , and told them that he would pay the �fine�, but that he would withdraw his cars from the meeting and leave immediately, which he did. Thus spectators on Sunday were unfortunately deprived the sight of three great Ferraris on the track. Footnote: The hostess with the �broken arm� was seen working as normal on Sunday with only an elastic bandage on it ! Practise for the Group C race, for disc brake sports racing and GT cars, saw a spirited battle between the Ferrari 512 S of Jean Guikas and the 512 M version of Patrick Stieger, with pole finally falling to the latter. This battle should have been joined by the Ferrari 712 CanAm driven by David Franklin, but gearbox problems thwarted his efforts before he could post a competitive time, thus he started from the opposite end of the grid. In the first race it was a fight between the two 512s to the chequered flag, joined by the proverbial piece of string until the Stieger car took better advantage lapping backmarkers, to put some breathing space between him and his pursuer. The 712 CanAm made rapid progress through the field up to third place by the end, but was also thwarted in its progress whilst lapping slower cars. On Sunday it was once again the 512 duo that fought the main battle as the 712 CanAm unfortunately did not appear. The Stieger 512 M led off the line but only as far as the first chicane where it spun in spectacular fashion. This allowed the 512 S into a lead that it maintained to the end, with the 512 M recovering to finish second after a strong comeback drive from Patrick Stieger, ahead of David Piper in his Ferrari 365 P. The race also featured a great duel in the GT category, that finally went to the Ferrari 365 GTB/4C of Francois Degand, ahead of the 250 GTO of Frederico Kroymans and the 250 GT SWB of compatriot Bart Rosman. The F1 car demonstration brought out a broad range of mainly recent Ferrari F1 cars, although there was the 1952 500 F2 of Jo Vonlanthen, whilst the next oldest was the 1975 312 T of Leopold Hrobsky, with the remainder being nineties examples. No worry, the sound of those screaming V10 and V12 engines, even when being driven below the limit by gentleman drivers is pure delight. On Sunday afternoon the Shell Ferrari Maserati Historic Challenge cars lined up along the pit wall �Le Mans� style, for the trophy presentations by Michael Schumacher. Upon his arrival, the packed grandstands overlooking the presentation area on the main straight erupted in a cacophony of cheers and air horns. After an interview with the commentator he presented the trophies, signed numerous autographs, that included one on David Piper�s 365 P (which will no doubt increase its value), and then posed for a �family photograph� with all the drivers, before a finale run up and down the pit straight in a 360 Spider. Despite overcast skies, that oft times seemed very threatening, the only rain came on Saturday evening so the racing programme remained unaffected, apart from a damp track on Sunday morning. Thus a large number of spectators enjoyed a diverse selection of Ferraris of all types over the weekend, with some fine racing, and Michael Schumacher as the bonus attraction.